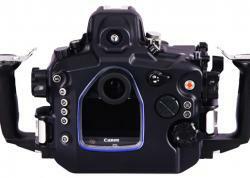 Ikelite has announced the release of their housing for Canon's EOS 100D Rebel SL1. This is the first housing to hit the market for SL1 shooters, who will be pleased to have a compact housing for the "world's smallst and lightest digital SLR camera." As always, if you'd like more details on this housing, contact the team at Bluewater Photo. Professional performance that fits in the palm of your hand. 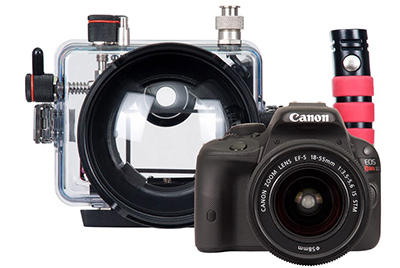 Canon calls the EOS Rebel SL1 100D camera "The World's Smallest and Lightest Digital SLR Camera." 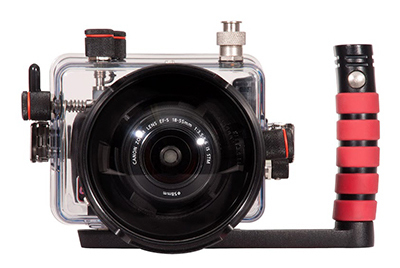 We call it one of the best packages for underwater use we've ever offered. Enjoy the responsiveness, razor-sharp image quality, and creative control of a DSLR in a truly miniaturized package essential for streamlined air travel. The EOS Rebel SL1 100D camera captures vibrant 18.0 megapixel stills and colorful, full HD video over an impressive 100-12800 ISO range. The included Canon EF-S 18-55mm STM lens is the perfect companion for shooting both wide angle and close-up on a single dive. Let your imagination run wild - there's no limit to what you can do with this system. TTL or "Through-The-Lens" flash metering means the camera controls flash duration to properly expose an image. Unlike fiber optic systems, which attempt to copy the behavior of the camera's built-in flash, this unique housing for the Canon EOS 100D Rebel SL1 provides direct, electrical transmission of this TTL signal to the strobe*. We've packed a lot in a small package, only slightly smaller than the EOS 100D camera and just as comfortable to hold. Set up is a snap with simple, fully front-loaded camera installation. The camera mounting shoe is designed to be unobtrusive and allow changing of battery and memory cards, or attachment to a surface tripod without being removed from the camera. A smooth-action, sensitive shutter trigger is right at your fingertips whether holding the side of the housing or the optional dual tray with quick release handles. Controls are provided for all camera functions except for the rear touchscreen, so you have complete creative control anywhere you go. 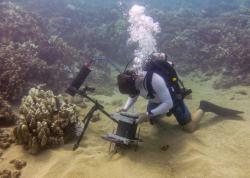 For a system of this caliber, a tray with handle is essential to good handling, balance underwater, and attachment of external lighting. The complete handle assembly removes with just two nut for traveling. 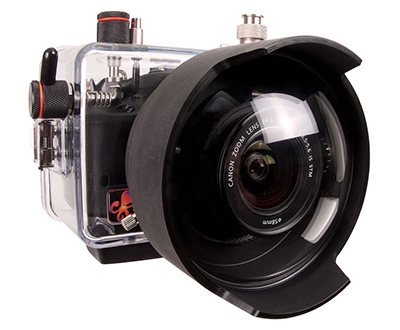 This housing comes standard with an optical grade acrylic dome port with zoom ring. This port provides sharp images and zoom capabilities with both the Canon EF-S 18-55mm STM kit lens, plus the popular Tokina 10-17mm lens. Minimal vignetting (dark shadows in the corners of the image) will be present in the 10-12mm range when used the Tokina lens. 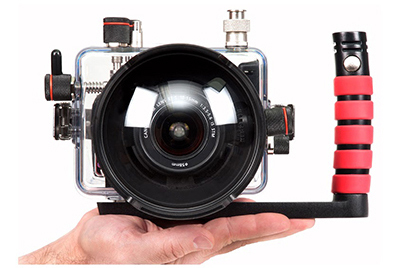 A special zoom gear system allows the camera with lens attached to be installed from the back of the housing, without requiring removal of the dome port. The dome port may be removed without tools to attach the optional Flat Port for the Canon EF-S 60mm Macro lens. Simply loosen the securing thumb screws and slide the port off. The optional Flat Port allows use of the 60mm Macro lens in auto-focus mode and features 67mm front threads for the optional attachment of macro converter wet lenses. Like every Ikelite product, this housing is designed, built and tested in the USA. We use locally sourced, top-grade materials. Our housings are built by hand and individually tested for fit, function and waterproof integrity. We pride ourselves in being readily available to help our customers with any need. 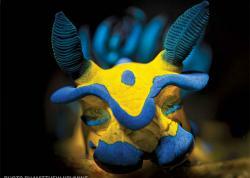 We back our products with over 50 years of experience and the best service in the dive industry.